Air Force assignments are governed by Air Force Instruction 36-2110. Qualified people with the needed skills must be in the right job at the right time to meet the Air Force mission. At the same time, the Air Force has a responsibility to keep attuned to the demands placed on its members resulting from personnel tempo, a quality-of-life metric that measures the amount of time an individual spends away from his or her home station for operational and training purposes, such as temporary duty or designated dependent-restricted assignments. Consequently, the Air Force classifies and assigns people worldwide as equitably as possible to ensure a high state of readiness. While the primary consideration in selecting personnel for reassignment is the member’s qualifications to accomplish the mission, the Air Force also considers additional factors. The Air Force assigns members without regard to color, race, religious preference (except chaplains), national origin, ethnic background, age, marital status (except military couples), spouse’s employment, education or volunteer service activities of spouse, or gender (except as provided for by statute or other policies). The Special Experience Identifier (SEI) system complements the assignment process and is used when specific experience or training is critical to the job and no other means is appropriate or available. The SEI system is also used to rapidly identify personnel to meet unique circumstances, contingency requirements, or other critical needs. Manpower positions are coded with an SEI to identify positions that require or provide unique experiences or qualifications. While some assignments require special experience, the vast majority of Air Force enlisted assignment slots do not. Positions often require members assigned to have access to a specified level of classified information. Selection for these jobs may be necessary from among members who currently have access or can be granted access immediately. Within a group of qualified members who meet the minimum eligibility criteria for PCS selection, volunteers are selected first. Non-volunteers qualified to fill a requirement who meet the minimum PCS eligibility criteria are selected ahead of qualified volunteers who do not. For example, time on station (TOS) is a PCS eligibility requirement. A qualified volunteer who meets the minimum TOS requirement is considered first in order of longest on the station. Next, the qualified non-volunteer who meets the TOS requirement in the order of longest on station and finally the qualified volunteer who does not meet the TOS requirement may be considered. First-term Airmen serving an initial enlistment of four or more years may not be given more than two assignments in different locations following initial basic and skill training during their first four years of service, regardless of tour length. First-term Airmen who make two PCS moves are permitted an additional PCS in conjunction with an approved humanitarian reassignment, a join-spouse assignment, as a volunteer, or when the PCS is a mandatory move (such as returning from a tour at the end of the prescribed tour length). A member is considered available for reassignment on the first day of the month in which they're available. Deferments may be authorized when possible in most grades and jobs to maintain an equitable assignment system and also support the need for stability in certain organizations or functions. Deferments are normally approved to preclude a member’s PCS while they're being evaluated for suitability or during a period of observation or rehabilitation. Deferments also exist for such things as completion of an educational program or degree, to serve as a witness for a court-martial, when accused in a court-martial, to control the roster, Article 15 punishment, base of preference (BOP) program, retraining or humanitarian reasons. The humanitarian policy provides reassignment or deferment for Air Force members to assist them in resolving severe short-term problems involving a family member. The problem must be resolvable within a reasonable period of time and the member's presence must be considered absolutely essential to resolve the problem. Family members under the humanitarian program are limited to a spouse, children, parents, parents-in-law, and those persons who have served in loco parentis (one who has exercised parental rights and responsibilities in place of a natural parent). While brothers and sisters are not included in the definition of family member for humanitarian consideration, a request involving a brother's or sister's terminal illness often is considered as an exception to the policy. The Exceptional Family Member Policy (EFMP) is a separate and distinct program from the humanitarian policy. This program is based on a member's need for special medical or educational care for a spouse or child that is required long-term, possibly permanently. It is not a base-of-choice program as assignment decisions are based on manning needs of the Air Force at locations where a member's special medical or educational needs for a spouse or child can be met. Under the EFMP, a member may receive a reassignment if a need arises for specialized care that cannot be met where they are currently assigned. A deferment from an assignment may be provided for a newly identified condition if the member's presence is considered essential. The purpose of such a deferment is to allow the member time to establish a special medical treatment program or educational program for the exceptional family member. Each member of a military couple serves in his or her own right. This means military couples must fulfill the obligations inherent to all Air Force members they are considered for assignments to fill valid manning requirements and must perform duties that require the skills in which they are trained. Provided these criteria are met, military couples may be considered for assignment where they can maintain a joint residence. In very limited circumstances a member may ask for a voluntary PCS and agree to pay all expenses involved. Also, travel time is charged as ordinary leave. Members must meet all PCS eligibility criteria for the type of move requested. Permissive PCS may not be granted based solely on the willingness of a member to move at his or her own expense. The voluntary stabilized base assignment program provides airmen a stabilized tour in exchange for volunteering for an assignment to a historically hard-to-fill location. Normal personnel support facilities (military or civilian) aren’t available at certain continental U.S. (CONUS) stations or within a reasonable distance. This creates a degree of hardship for personnel assigned to these stations. To prevent involuntary assignment at these locations for long periods, the Air Force established a minimum 15-month tour for single and unaccompanied personnel and a minimum 24-month tour for accompanied personnel. Individuals assigned to a CONUS-isolated station may request reassignment upon completion of the tour. The Extended Long On Station Tour Length (ELT) volunteer program applies to airmen who volunteer for PCS OS to a long-tour location (one where the accompanied tour length is 24 months or more and the unaccompanied tour length is more than 15 months). Airmen who volunteer for an ELT agree to serve the standard tour length plus an additional 12 months. Airmen who have not yet been selected for a PCS may request a deferment from assignment selection when they have nearly completed high school, vocational program, or college degree requirements. Requests for deferment are processed through the education office (which will confirm eligibility). Airmen may be deferred up to 9 months to complete high school or up to 12 months to complete a college degree. All military members ensure arrangements are made for the care of their dependents when they must be separated due to TDY or PCS. Military couples with dependents and single-member sponsors are expected to fulfill their military obligations on the same basis as other members. They are eligible for worldwide duty and all assignments for which they qualify. To ensure all members remain available for worldwide duty, they must have workable plans to provide parent-like care for their dependents as outlined in AFI 36-2908. Members who cannot or will not meet military commitments due to family needs will be considered for discharge. Members adopting children are given a limited time to complete the official adoption process. Individuals may be authorized deferment during the four-month period following the date a child is officially placed in the member’s home. Family members (parents, spouse, brothers, sisters, and children) will not be assigned to the same unit or function where one member may hold a command or supervisory position over the other. Once a member is selected for PCS and orders are published, cancellation of the assignment could impose a hardship on the member. A PCS should not normally be canceled within 60 days of the projected departure date unless the member cannot be effectively used at the projected location. Cancellation may be authorized by the assignment OPR (Office of Primary Responsibility). If the member indicates a hardship will exist as a result of the cancellation, then the MPF will direct the member to prepare a written statement containing the details of the hardship. The statement should be coordinated through the unit commander to the MPF. Airmen who are selected for PCS, TDY, or training and who do not want to participate in an event may elect to request retirement under the 7\seven-day option provision (assuming they have more than 20 years of service and are retirement eligible). 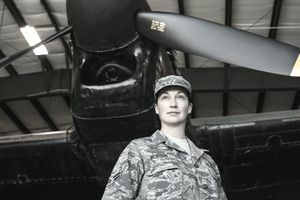 Airmen who elect to retire are ineligible for promotion consideration and are ineligible for an extension of enlistment or reenlistment, except as authorized in conjunction with a request for retirement. Aside from the seven-day option provision, airmen who do not have the minimum required retainability for the event may be eligible to decline the assignment. Declining an overseas assignment by refusing to obtain the required retainability usually results in immediate re-enlistment ineligibility, which usually results in becoming ineligible for promotion.